You will find these speakers in the world’s finest boats... and in the best sounding ones, too! Engineering, environmental testing and assembly all take place in the Miramar, Florida facility, ensuring consistent process control and component part quality. Purpose-engineered and built for real marine duty, the M-series component systems deliver maximum audio performance in&nbsp;any open-air boating environment. The oversized 7.7-inch design of the M770-CCS component woofer&nbsp;results in increased efficiency (more output for a given amount of power).&nbsp;Combine that advantage with long excursion and excellent power handling&nbsp;and you have a speaker system truly capable of playing loud and clear in&nbsp;a powerboat at speed. The M770-CCS component woofer is optimized to&nbsp;operate with a large volume of air behind it (at least 2 cu. ft. / 57 l). If you&nbsp;need a system with a 7.7-inch component woofer that operates in a small&nbsp;sealed enclosure, select JL Audio&rsquo;s M770-TCS, instead. 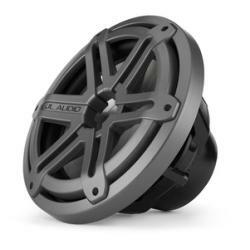 To keep up with the&nbsp;capabilities of the component woofer, JL Audio employ a 1-inch pure silk&nbsp;dome tweeter that is specially treated to withstand the marine environment.&nbsp;Silk has been chosen for its lightness, excellent damping properties and&nbsp;smooth response characteristics. You will appreciate the clean, articulate high-frequency response of the M-series dome tweeter, especially at&nbsp;higher volume levels. A true 2-way passive crossover network is sealed in a protective capsule and mounted to the woofer&rsquo;s frame so that it does&nbsp;not require additional mounting provisions. Although M770-CCS component systems can be used with as little as 40 W per channel, for best&nbsp;audio performance JL Audio recommends amplifiers capable of between 75-150W of continuous power per channel. Sold as a pair. Purpose-engineered and built for real marine duty, the M-series component systems deliver maximum audio performance in&nbsp;any open-air boating environment. 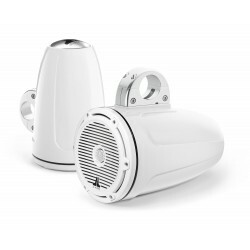 The oversized 7.7-inch design of the M770-TCS component woofer&nbsp;results in increased efficiency (more output for a given amount of power).&nbsp;Combine that advantage with long excursion and excellent power handling&nbsp;and you have a speaker system truly capable of playing loud and clear in&nbsp;a powerboat at speed. The M770-TCS component woofer is optimized to&nbsp;operate in a small sealed enclosure, such as a tower speaker system. If you&nbsp;need a system with a 7.7-inch component woofer that operates without&nbsp;a dedicated enclosure, select JL Audio M770-CCS, instead. 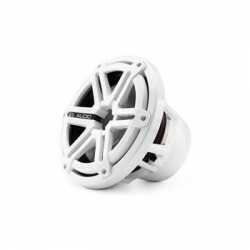 To keep up&nbsp;with the capabilities of the component woofer, JL Audio employ a 1-inch&nbsp;pure silk dome tweeter that is specially treated to withstand the marine&nbsp;environment. Silk has been chosen for its lightness, excellent damping&nbsp;properties and smooth response characteristics. You will appreciate the clean, articulate high-frequency response of the M-series dome tweeter,&nbsp;especially at higher volume levels. A true 2-way passive crossover network is sealed in a protective capsule and mounted to the woofer&rsquo;s frame so&nbsp;that it does not require additional mounting provisions. Although M770-TCS component systems can be used with as little as 40 W per channel,&nbsp;for best audio performance JL Audio recommends amplifiers capable of between 75-150 W of continuous power per channel. Sold as a pair. Replacement woofer and tweeter sport grilles for M-series 7.7-inch component&nbsp;systems. This kit contains two 7.7-inch component woofer grilles, two component&nbsp;tweeter grilles and eight woofer grille badges (four colours, right and left facing).&nbsp;Use this kit to replace damaged grilles or to convert a classic grille component&nbsp;system to the sport grilles. 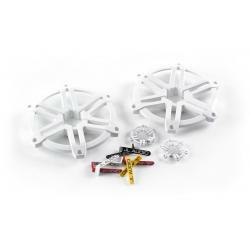 Will not fit M-770 coaxial system, M650-CCX or MXseries&nbsp;component speakers.Sold as a pair. Purpose-engineered and built for real marine duty, M-series coaxial systems deliver maximum audio performance in any open-air&nbsp;boating environment. The oversized 7.7-inch design of the M770-CCX coaxial results in&nbsp;increased efficiency (more output for a given amount of power). Combine&nbsp;that advantage with long excursion and excellent power handling and&nbsp;you have a speaker system truly capable of playing loud and clear in a&nbsp;powerboat at speed. The woofer element is optimized to operate with a&nbsp;large volume of air behind it (at least 2 cu. ft. / 57 l). 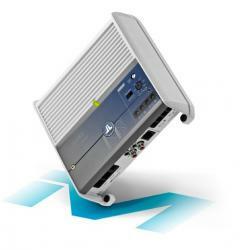 Operating this coaxial&nbsp;system in less space will compromise its low frequency performance. If you&nbsp;need a 7.7-inch coaxial system that operates in a small sealed enclosure,&nbsp;select JL Audio&rsquo;s M770-TCX, instead. 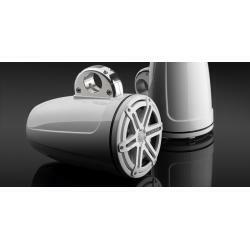 A 1-inch pure silk dome tweeter,&nbsp;specially treated to withstand the marine environment, handles the highfrequency&nbsp;duties. Silk has been chosen for its lightness, excellent damping&nbsp;properties and smooth response characteristics. You will appreciate the clean, articulate high-frequency response of the M-Series dome tweeter,&nbsp;especially at higher volume levels. A true 2-way passive crossover network is sealed in a protective capsule and mounted to the woofer&rsquo;s frame sothat it does not require additional mounting provisions. Although M770-CCX coaxial systems can be used with as little as 40 W per channel, for&nbsp;best audio performance JL Audio recommends amplifiers capable of between 75-150 W of continuous power per channel. Sold as a pair. The same principle that makes JL Audio&rsquo;s 7.7-inch marine speakers dominate over conventional 6.5-inch designs is delivered&nbsp;in a more powerful dose in JL Audio&rsquo;s M880-CCX 8.8-inch coaxials. These 8.8-inch diameter monsters offer significant performance advantages&nbsp;over JL Audio&rsquo;s 7.7 inch models, and a huge advantage over conventional&nbsp;6.5 inch marine coaxials. Thanks to 36% more cone area and almost double&nbsp;the excursion capability, the M880-CCX&rsquo;s are capable of +6 dB greater low&nbsp;frequency output than JL Audio&rsquo;s M770-CCX 7.7-inch coaxial systems! The&nbsp;bass is so impressive that the M880-CCX can be used without a subwoofer&nbsp;while still packing a very serious low-frequency punch. Used with a&nbsp;subwoofer, they offer vastly better dynamics and mid-bass impact than smaller speakers, making them the best choice when ultimate performance&nbsp;is desired. To make sure that the high-frequencies sound just as good as&nbsp;the bass, JL Audio&rsquo;s engineers have designed an oversized (1.20-inch), silk&nbsp;dome tweeter for this model. This new tweeter plays louder, cleaner and extends lower in frequency to better mate with the 8.8-inch woofer. A&nbsp;high-quality, true 2-way crossover network precisely filters and balances the coaxial system for outstanding fidelity. Although M880-CCX coaxial&nbsp;systems can be used with as little as 50 W per channel, for best audio performance JL Audio recommends amplifiers capable of between 125-250&nbsp;W of continuous power per channel. Sold as a pair. Purpose-engineered and built for real marine duty, MX-series coaxial systems deliver excellent performance at a more&nbsp;affordable price than JL Audio&rsquo;s maximum-performance M-series models. 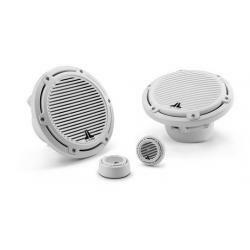 The MX650-CCX 6.5-inch coaxial speaker is designed around the standard marine 6.5-inch speaker format and features&nbsp;a wide mounting flange with a four hole mounting pattern. The long excursion woofer design and excellent power handling make your music&nbsp;come through loud and clear at speed, or at anchor. 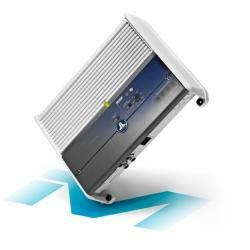 The woofer design is optimized to operate with a large volume of air behind it (at least 2&nbsp;cu. ft. / 57 l). Operating this coaxial system in less space will compromise its low frequency performance. 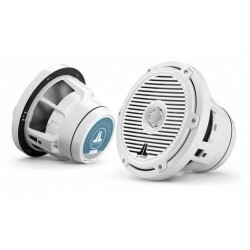 A 0.75-inch pure silk dome tweeter,&nbsp;specially treated to withstand the marine environment, handles the high-frequency duties. Silk has been chosen for its lightness, excellent damping&nbsp;properties and smooth response characteristics. Although MX650-CCX coaxial systems can be used with as little as 20 W per channel, for best&nbsp;audio performance JL Audio&rsquo;s recommends amplifiers capable of between 75-100 W of continuous power per channel. Sold as a pair. Enclosed in these beautiful, injection-molded enclosures are JL Audio&rsquo;s maximum-performance, M-series 7.7-inch coaxial&nbsp;tower speakers. Specifically tuned for tower enclosure applications, these coaxial drivers deliver clean, loud audio that can be&nbsp;heard well beyond the boat when mounted up high. 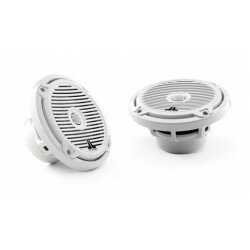 The enclosures feature a decorative, aluminium logo cap on the end opposite the speaker, which can be oriented to match any custom mounting&nbsp;application. Each is designed to mate with one of JL Audio&rsquo;s clamp systems (sold separately - see page 733, and available to fit a wide range&nbsp;of pipe diameters). The wire exits through the center of the mount, staying high and dry, and out of sight. Professional installation is strongly&nbsp;recommended. For best results, JL Audio recommends powering these systems with an amplifier in the 75-150 W per channel range. Like all JL&nbsp;Audio marine speakers, this system is built to with stand a real saltwater marine environment and deliver years of listening enjoyment. Sold as a&nbsp;pair. Enclosed in these beautiful, injection-molded enclosures are JL Audio&rsquo;s high-performance, MX-series 7.7-inch coaxial tower&nbsp;speakers. Specifically tuned for tower enclosure applications, these coaxial drivers deliver clean, loud audio that can be heard&nbsp;well beyond the boat when mounted up high. 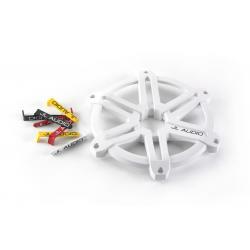 The enclosures feature a decorative, aluminium logo cap on the end opposite the speaker, which can be oriented to match any custom mounting&nbsp;application. Each is designed to mate with one of JL Audio&rsquo;s clamp systems (sold separately - see page 733, and available to fit a wide range&nbsp;of pipe diameters). The wire exits through the center of the mount, staying high and dry, and out of sight. Professional installation is strongly&nbsp;recommended. For best results, JL Audio recommends powering these systems with an amplifier in the 25-150 W per channel range. Like all JL&nbsp;Audio marine speakers, this system is built to withstand a real saltwater marine environment and deliver years of listening enjoyment. Sold as&nbsp;a pair. This replacement grille kit allows you to change the look&nbsp;of your classic grille-equipped M10IB5 or M10W5 to the&nbsp;sport look. It can also be used to replace a damaged or&nbsp;missing grille. The kit includes one (1) grille, plus right&nbsp;and left-facing logo badges in white &amp; titanium, yellow,&nbsp;red and black. Marine-grade polymer construction. Thanks to its ability to act as a &ldquo;one-box solution&rdquo;, the MHD900/5-24V is ideal for installations where space is at a premium and sound quality is the paramount goal. While extremely compact, this amazing amplifier will comfortably drive a complete high-performance marine audio system: that is, four satellite speaker systems and a subwoofer system... with a very serious 900 watts of power! Using JL Audio&rsquo;s Single Cycle Control switching design and R.I.P.S technology, the MHD900/5-24V delivers 100 W x 4 to its four main channels, plus a very meaty 500W to its subwoofer channel. Thanks to R.I.P.S., high power can be delivered over a wide range of load impedances, while the tight power supply regulation keeps distortion down, maximizing sound quality. This marine amplifier features white and grey powder-coat finishes, a gasketed cover for the controls and stainless steel hardware for durability in the marine environment. 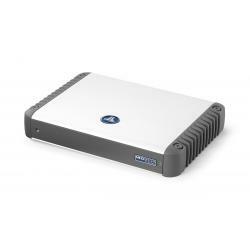 This amplifier is designed for operation in vessels with 24 volt, negative-ground electrical systems. Use of this&nbsp; &nbsp;roduct in vessels with positive ground and/or voltages other than 24 V may result in damage to the product and will void the warranty. This tiny amplifier packs a serious full-range punch, delivering a staggering 100 watts per channel into 2 &Omega; (14.4V, 1% THD). The breakthrough&nbsp;that makes this much power possible in such a small chassis is JL Audio&rsquo;s NexD&trade; ultra-high-speed switching design, which allows for full&nbsp;bandwidth class D operation with extremely low distortion and outstanding efficiency. The M200/2 includes a 12 dB / octave filter which can&nbsp;be configured as a low-pass or high-pass filter and offers continuously variable cutoff frequency selection from 50-500 Hz. With the addition of&nbsp;an HD-RLC remote level control (sold separately - see page 849), the amplifier&rsquo;s level can be controlled from a remote location. This marine&nbsp;amplifier features white and grey powder-coat finishes, a gasketed cover for the controls and stainless steel hardware for durability in the marine&nbsp;environment.